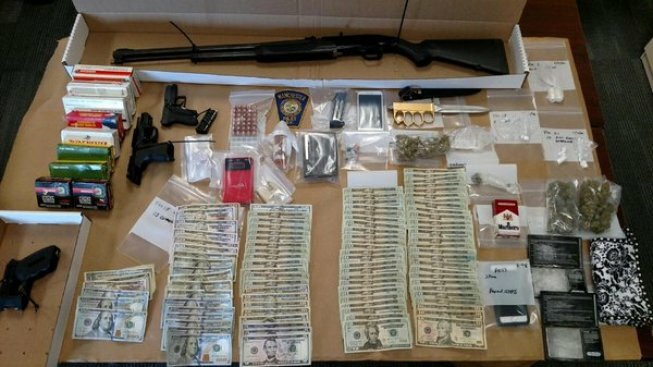 Police in Manchester, New Hampshire, arrested seven people and deized thousands of dollars worth of cash and drugs, in addition to several firearms, on Wednesday morning. Police in Manchester, New Hampshire, arrested seven people and seized more than $5,000 in drugs, cash and guns as part of an investigation involving suspected gang members on Wednesday. Members of the Manchester Police Special Enforcement Division and SWAT executed a search warrant Wednesday morning at 366 Massabesic St., 3rd floor, following a month-long investigation into the sale of heroin and the possession of firearms by suspected gang members. A separate warrant check was also conducted at 215 Wilson St.
Brian Rutherford, 18, for sale of a controlled drug, and two counts of possession with intent to distribute Oxycodone and heroin. Jennifer Sennott, 18, for possession with intent to distribute marijuana. David Hamilton, 18, for possession of a controlled drug. Daniel Jesus Cora, no age given, for falsifying physical evidence (firearm). George Robinson, no age given, for sale of a controlled drug, two counts of receiving stolen property, felonious use of a firearm and possession with intent to distribute heroin. Hayleigh Soares, 19, on an unspecified warrant. Kristine Soares, 42, on an unspecified warrant. Seized by police were 21.5 grams of heroin valued at $1,100, 10 Suboxone pills valued at $50, 2 Oxycodone pills valued at $10, 82.5 grams of marijuana valued at $600, 2.8 grams of Fentanyl valued at $100 and $2,298 in cash. Also seized was a stolen 9mm Berretta semi-automatic handgun, a 12-gauge Mossberg 500A shotgun and a .380 caliber Diamond Back semi-automatic handgun.